Rewards are only redeemable when purchasing direct through TheBathOutlet.com. Rewards are deducted from products prior to any discounts or coupon codes being applied. Rewards cannot be used towards shipping or tax. When you return or cancel merchandise that has earned you TheBathOutlet Rewards, it will decrease the value of your Rewards and your Rewards balance will be correspondingly adjusted. When you make a purchase, you will automatically earn 3% cash back in reward dollars towards any future purchase. Best of all, you'll be able to use that cash back on any future purchase. You can also accrue, collect, or save reward dollars and use them all on a single order. 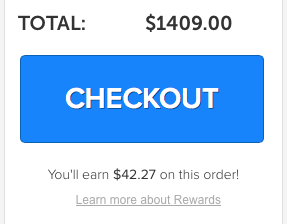 You can see the number of reward dollars you will be earning for a purchase on the shopping cart page, right below the "checkout" button.